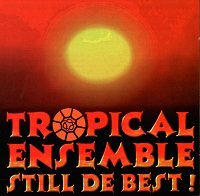 Tropical Ensemble - Still De Best! Few US based steelband recordings are impressive. Still De Best from Maryland deserves attention mostly because of how it compares to Tropical Ensemble's first CD, and the overall listening pleasure it gives in this one. The tone and styling sounds somewhat Panazzesque and the repertoire is to be commended. There are some familiar tunes - Tin Man is my favorite, and a few original compositions. Then there is Lluvia Azul - Gato Barbieri on Pan! Nicely rendered for quiet listening. I even liked the sad love song vocal. While these attributes make this CD a must for my personal collection, I did have a disappointment that seems to be an unfortunate feature even among the master Pannists of today. The Pan is sometimes overwhelmed by the other instruments - bass guitar, drums or keyboards. What is forgiving in this recording, as compared to many similar recordings of late, is that eventually the Pan gets at least equal decibel prominence. The trend toward understating the Pan takes away the distinctiveness of Pan in these fusion type ensembles and renditions. Most Pan music lovers want the evolution to continue but in the end it is Pan we want to hear. Still De Best gives us something to enjoy.